Soccer is the most popular sport in the world and as the preeminent soccer tournament, no other sporting event captures the attention of the globe like the World Cup. With four year gaps between tournaments and a rigorous qualification period, there are no guarantees about which players or teams will even appear in each event, but several top teams have become regulars in the ultimate soccer showdown. This worldwide popularity has carried over to a tremendous market for World Cup collectibles, including cards, stickers, jerseys and other various fan gear. Like the Olympics, the World Cup is not just about marquee names and quality soccer. The interest is further intensified by patriotism for the nations participating and that can be amplified for an underdog team that progresses through the stages. A collecting market exists for all 32 teams included in each tournament, but several teams sit at the top in 2014, including Germany, Spain, Argentina, Brazil and Portugal. 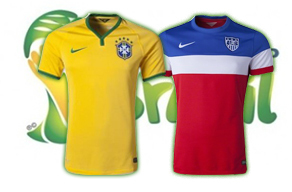 These teams and their star players headline the collecting frenzy that will take hold during the 2014 World Cup in Brazil. The following guide contains all the main World Cup products, guides, hot lists and profiles, conveniently organized for easy access. The official 2014 World Cup card products can be seen on the first tab above and the remaining guides and profiles can be viewed using the additional tabs. Collectors can also shop by team using the "Teams" tab and see the most viewed World Cup collectibles on eBay using our "Hot List" tab. The 2014 World Cup begins on June 12th and ends with the championship match on July 13th. View a complete schedule here. Panini is the primary producer of World Cup cards. The World Cup sticker set from Panini has been produced for every World Cup since 1970. Based on sheer volume, it is one of the most popular card products in history. The most current version is 2014 Panini World Cup Stickers and experts are already predicting that it will produce record-breaking sales. 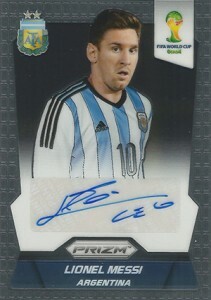 2014 Panini Prizm World Cup is a new mid-level offering, complete with Prizm technology and an extensive autograph roster, that has also proven to be very popular with collectors. Less popular, but still relevant, 2014 Panini Adrenalyn XL is a low-end card product that doubles as a game, and 2013 Panini Road to 2014 FIFA World Cup Stickers is a prelude product that offers an expanded look at the World Cup qualification teams. View detailed info for each release by following the links below. 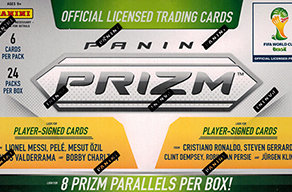 World Cup 2014 Panini Prizm HOBBY Hanger Box-on FIRE! Look for $2000 Autographs! 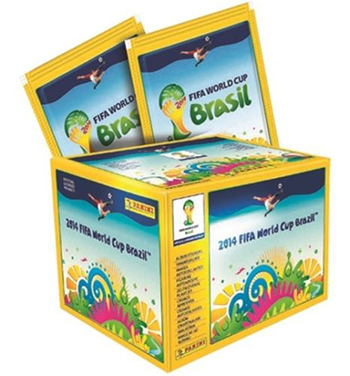 PANINI 2014 FIFA World Cup Brazil BOX of 100-Packs - ** clearance SALE! For a more detailed look at various World Cup products and players, we have compiled a list of the top articles for collectors to check out as they build their World Cup and soccer collections. 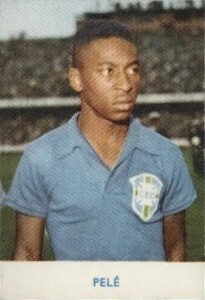 There are also guides and profiles for former greats in the world of soccer. 2014 Panini Prizm World cup Brazil: Team England 76 99 Purple. All the teams don't get the same recognition, but they all earned their place in the 2014 World Cup. 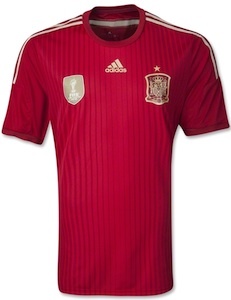 Shop for World Cup collectibles from your favorite country, using the listing below. Teams are organized alphabetically by their respective groups in the tournament. PUMA LUIS SUAREZ URUGUAY AWAY JERSEY FIFA WORLD CUP BRAZIL 2014. PUMA LUIS SUAREZ URUGUAY HOME JERSEY FIFA WORLD CUP BRAZIL 2014.